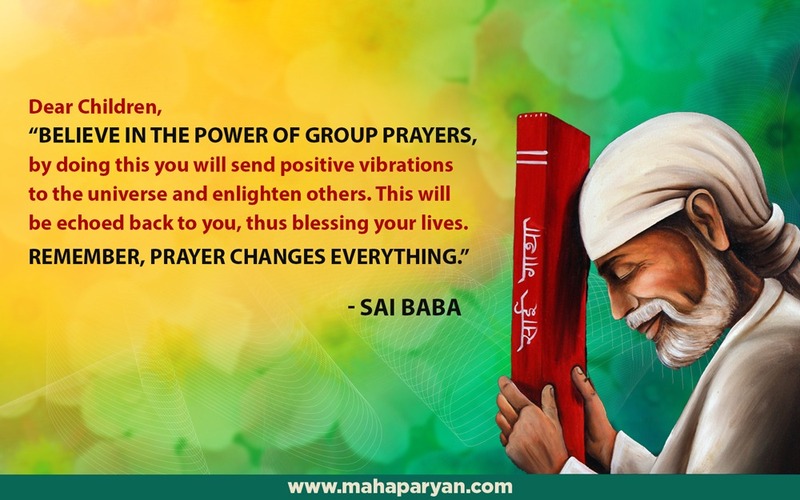 Anonymous Shirdi Sai Baba devotee from India says: I would like to share my experiences after starting Mahaparayan and if you feel it as fit, I request you to publish this on your blog so several other devotees can read my experience and further strengthen their faith in Sai. I request you to keep my identity anonymous due to certain personal reasons. I share my experience/s here under. At the outset I would like to state that I am (directly) not a part of any Mahaparayan group, however I have been reading chapters every Thursday and feel the bliss. This has been possible cause of someone who is very special, who is not only a believer and follower of Lord Sai Baba, but is one of His most favorite child. It's through her that I have had the opportunity to partake in the Mahaparayan every Thursday and ever since I have been reading Leelas of Sai Baba, I have seen a lot of positive changes in my relationship with this special person. I shall demonstrate how Baba made me a part of this wonderful mega event. As mentioned in Sai Satcharitra, like many others I too ran to God at the time of calamity or when faced with troubles in life. Since Childhood I remembered God only during exams, results or selection in the cricket team. When prayers were not answered, I kept away from temples and holy places only to go back at the time of next hurdle. With age and maturity (or lack of it) my faith in His power diminished. Though not an atheist, my prayers, remembering Him in my thoughts lessened to a very great extent. Now coming to reading and being a part of Mahaparayan, I have known this special person for the last 14-15 years. However in the last 5 years my relationship with her has grown stronger with every passing day. Certain events took place in September 2017, due to which our relationship took a 180 degree turn. Certain realities hit us hard. We had fights, arguments; suffice to state that our relationship was in turbulent times and on the verge of ending. However she held on, kept her calm and steered it. It is during this period she mentioned to me about Mahaparayan. Cause of our fights she had not finished her chapters and requested another group member to read them on her behalf. On learning that she was on a group which had certain people, angered me even more. She willingly agreed to exit the group for my sake. But then with the blessings of Sai, good sense prevailed and I asked her to continue. She explained to me that the object of Mahaparayan that it was a concept of group prayer/s not for the benefit of one individual, but for the world and society in general. She then forwarded a soft copy of Sai Satcharitra and also ordered a book online. Between one Thursday and the next, she convinced me to read the chapters with her every Thursday. Ever since that day, we have been reading the chapters together, sometimes even over phone. This is how I have now become a part of this great mega event. I certainly feel the bliss every Thursday after I read the allotted chapters. It has made our relationship stronger than ever. Also need to mention that after the first couple of weeks, I started my first Saptah. For some reason I began reading the book on a Friday and wanted to complete it on Thursday. It so happened that on that particular Thursday, we were allotted the final chapter/s and therefore my Saptah and Mahaparayan were merged together. Needless to state that this wasn’t planned in any manner. Can it get any better? Merging my first Saptah with Mahaparayan, Is this not His Leela or his blessing?. Also appropriate to mention that Lord Sai still continues to put us through test, week after week. We have fights every Wednesday, sometimes even feel that we should end this and part ways. But comes Thursday, we are back together reading His leelas and seek His blessings. We know He is present with us and blessings us. All He wants is Shraddha and Saburi (faith and patience ). I once asked her, why didn't she refer my name to be a part of Mahaparayan when she had referred several other names. She replied “ You know the answer”. There was no doubt that I would have refused to join the event when it had started during Dussehra 2017. But as Sai has His own ways and timing, He knew when and how to make me part of this event. Thank You Sai as You have accepted me as Your Devotee. Faith and patience, it's easier said than practiced. But it's only when we attain these qualities, is when we completely surrender to our guru. I am yet to learn these traits. It's not easy, I am yet to be His deserving devotee, yet He has done so much for me. Thank You Sai. Bow to Shri Sai . It is only on account of Rinanubandh that we come across any being in this birth. So we should practice to understand that it’s His will and try our best to treat every being considerably. Baba the most merciful Guru, Deva ever will certainly guide us to sail through the relationships and thus help us cross this worldly ocean. Love You Loads. JAi Ho Sai. Om Sairam! I feel like Baba is sharing my story through your experience like he does in Satcharita. Thank you for sharing and may Baba bless you with happiness and devotion.